Here they are, folks: your choices for your Favorite Layouts Featured on This Site During 2009. For fun, I’ve added some previously-unpublished photos of the ones who got the most votes. While I was at it, I also included some other articles I’ve been saving just because they are fun, and I thought you might like to share them today. But if you can’t wait to find out the layout voting results, go there now. 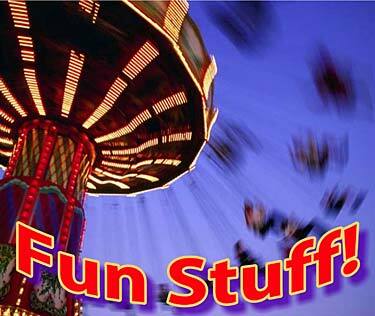 At the bottom of the page you’ll find a link that brings you back here to peruse the rest of the goodies. A Myth Exploded—Do wye turnouts always save space? 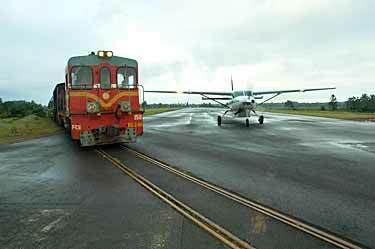 Railways Crossing Runways—They do it more often than you think! Joe Lockhart, from Indianapolis, Indiana, USA, won a strange prize at his mother’s “Dirty Bingo” game last Thanksgiving… it was a bear that blows bubbles. Joe cleaned it up and made it work, put in fresh batteries, and placed it in the center of his new micro layout built on a Coca Cola case. 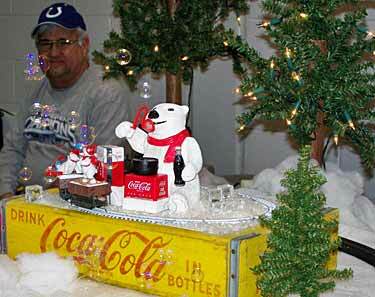 Just for kicks, he took it along to the Christmas Train Show (that’s Joe on the left in this picture). A star was born (we mean the bear)! 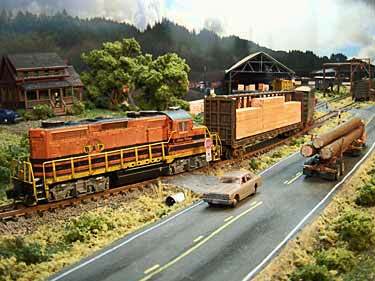 The layout is an oval of HO track with an On30 train running round and round. There’s another polar bear driving the loco (drinking Coke) and small flea-market bears in each car. But the big hit was Bubba the Bubbling Bear. Joe made a video of him, and you can see his star quality right away. Take a look (it’s one of the few recent videos that have made me laugh out loud)! Thanks, Joe! on a new page. Click “RETURN” to come back here. A WORD TO THE WYES: DON’T BELIEVE ALL YOU HEAR! The crunch you hear is the sound of a myth collapsing. “Everyone knows” that wye (Y) turnouts save space in minimum-space layouts compared to standard turnouts that have one straight and one curved leg. We’ve all heard that truism dozens of times, in these pages and elsewhere. But is it true? Cyril Freezer, longtime editor and doyen of British track planners, fostered this idea in the 1950’s in his famous little book, “60 Plans for Small Railways.” He designed a small country terminal station in OO/HO scale using nothing but wyes, in just four feet of length, compared to six feet required for the same station with conventional turnouts (or so he claimed). 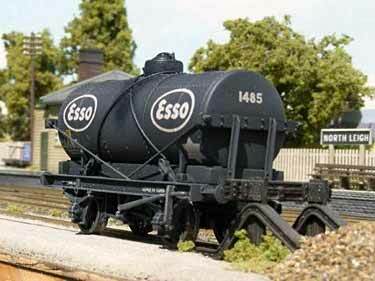 I’ve reproduced his design (above) using Peco Set Track, and it certainly looks both ingenious and legitimate. But let’s reconsider. A couple years ago, under Cyril’s influence, I drew up a three-square-foot terminus that works as both a British country station and a U.S. industrial switching yard—using wyes throughout. Paul Boehlert, from Atlanta, Georgia, USA, built it and called it Mill Street, showing that it works very well for operations. He used wye switches, per the original plan. But look! He claims to have been influenced by Diego De Bunder’s layout, Wye River City, which uses straight switches in almost the same space! What happened to the space saving with wyes? I checked it out by redrawing the original layout using straight-legged Atlas turnouts… and guess what? The terminus takes almost exactly the same area (below)! The space saving, at least in this case, is a myth! I’m baffled. Anybody else have an example pro or con? Our story last time, about the airport runway at Gisborne, New Zealand, that was crossed by an active railway line, generated more mail than any other recent article. First off, several readers sent links to photos of the Gisborne crossing, especially one dramatic shot (above) taken by Peter McGavin during a rail fan excursion in 1993. Far as we know, that runway crossing is still active! Next out of the blocks were the Aussies, perhaps in a competitive mood, who called our attention to two runway level crossings in Australia! 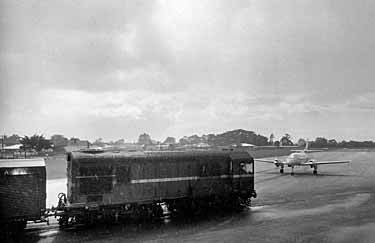 First is Sydney Mascot—Kim Mihaly provided New South Wales Railway track and signalling diagrams at Kingsford-Smith Aerodrome (left). 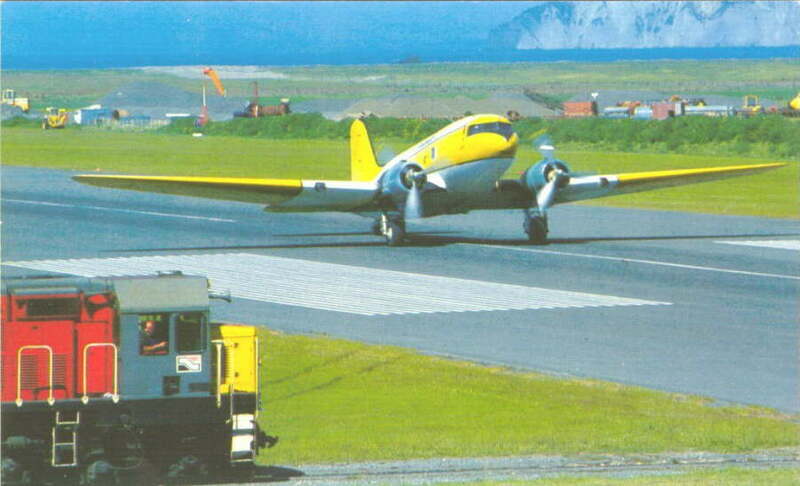 Graham Smith and Greg Mashiah both provided a link to a description and photos of a 1950 crash when a DC-3 ran into a train of empty coal wagons crossing the runway, unfortunately this website is no longer active. As a result, the railway was rerouted and the crossing closed. As far as we know, this is the only serious accident to have occurred at a railway-runway crossing anywhere in the world. The other Australian crossing was in Wynyard, Tasmania. 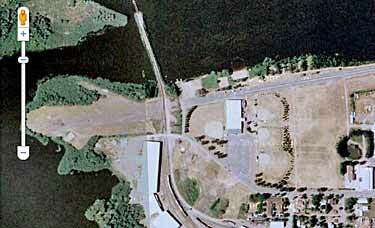 Graeme Brown sent a link to the Australian Airways Museum website with a lovely photo of this airport (left below). Graham and Greg chimed in on this one, too. Closure of the branch railway line in 2005 marked the end of this crossing. While we’re in the southern hemisphere, Mark Peterson called our attention not only to Sydney Mascot and Wynyard, but also to another rail-runway crossing at Manakara Airport in Madagascar (lower right). 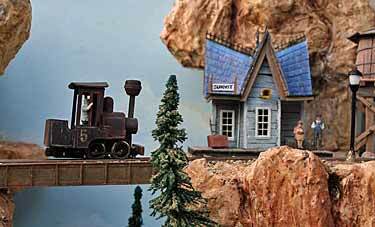 Mark sent a link to this photo of a meter-gauge branch line crossing an active runway. As far as we know, this crossing is still active. Moving into the northern hemisphere, Mark also pointed out a railway-runway combination in Peshawar, Pakistan. 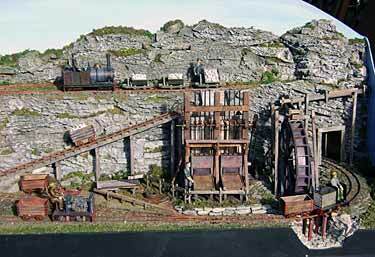 This crossing, still active today, is part of the exotic Khyber Pass Railway, and this link provides lots of inspirational modeling information. 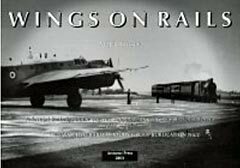 Bill Corser sent along a link to the cover of his book about wings and rails, showing the RAF field at Ballykelly, in Northern Ireland (right). David Richardson, who also identified the crossing, commented that his father may have been on the train shown on the book cover! “It was an enthusiast special to Londonderry circa 1970, about the time I was born!” David reported, and added that the airport was closed about 35 years ago, but the railway still crosses the now derelict runway. Ian Sinclair provided links to several other photos of this runway crossing, but the websites disappeared in time. Max Sarazin, who started this whole thread, identified the WW2 US Air Force veteran who had originally mentioned a runway-crossing railroad in Europe. It was Dave Eagles, from Cape Cod, Massachusetts, USA, and the airport was Bari, in Italy. 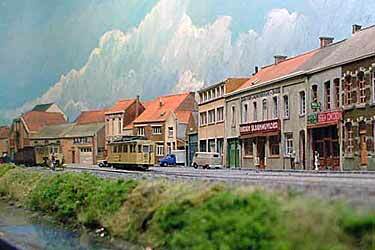 Ivan Furlanis, who lives in Padua (Padova), Italy, confirmed, “A steam interurban 750 mm gauge tramway crossed Bari Palese airport (or rather, the airport runway was built crossing the existing tramway). The right-of-way of the rail line is still visible looking at aerial maps (below right shows a Google Maps image).” Ivan provided a 1950’s era military map (lower left) showing the crossing, which continued in operation until the tram closed in 1959. From Stockholm, Anders Lundin wrote, “In Mid-Sweden the railroad line Marma-Sandare crossed the runway of an air force base. The railroad started operating in 1858. During WW2, the Swedish Air Force built an AFB outside the city of Soederhamn. The railroad was rerouted not to be in the way of the runway. However, in the 1950s, the introduction of jet airplanes forced an extension of the runway and as the railroad could not be be rerouted again due to lack of space, the runway got a level crossing with the railroad… This procedure was in use between 1963 and 1980. Approximately 10 trains a day used the line and no accidents have been reported.” There’s a confirming Swedish text and photo here. Kurt from Sweden also reports a crossing in Visby, the main city of the island of Gotland, in the middle of the Baltic Sea. A narrow-gauge line crossed the airport runway, a condition which held until the railway was closed in 1960. Finally, the reported crossing at Havana’s José Martí Airport, though strongly suspected, is not confirmed. Several readers found, as I did, that there was scarring beside the main runway that looks like the remains of a railroad crossing (John Day provided a link and Gordon Werner also observed the remains). Diligent searching (and even telephoning of old pilot friends) by several readers failed to find any evidence that an active runway crossing ever existed. 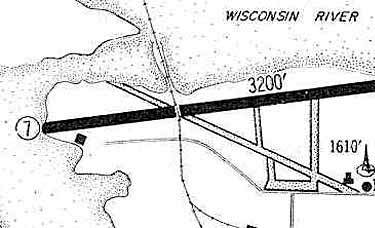 It seems likely that the railroad (established long before the airport was built) was rerouted at the time the runway was built. 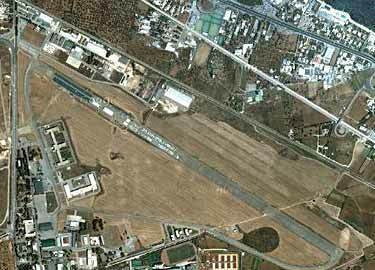 Its tracks and ties may well have been torn up later, after construction was complete and the airport was open for business. If anyone has evidence to the contrary, we would love to see it! So, in summary: We now have confirmed evidence of 11 railway-runway level crossings, past and present, around the world. Of these, it appears that only three remain active today: Gisborne, New Zealand; Manakara, Madagascar; and Peshawar, Pakistan. So now you know. 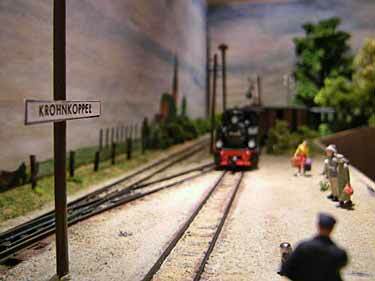 Thanks to all readers who supplied information for this list… you’ve demonstrated extremely well how the Internet and model railroading combine to shrink the earth! 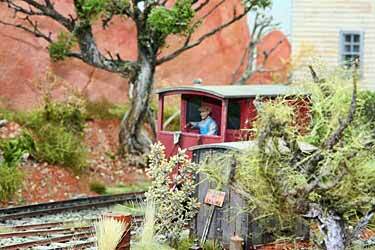 Queen of the Far Tottering & Oyster Creek Railway was an amazing locomotive named Nellie, who has been reproduced—along with a range of rolling stock, crew and passengers—by Smallbrook Studio in 1:24 scale running on 16.5mm track (sometimes called Gn15). 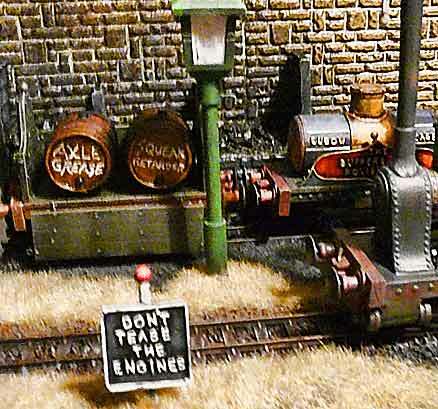 Mark Goodwin has taken advantage of the availability of these wonderful resin miniatures to model an Emett-like railway of his own imagining, the Much Gnattering & Far Twaddle Light Railway (you can see what exposure to Emett does for one’s imagination!). 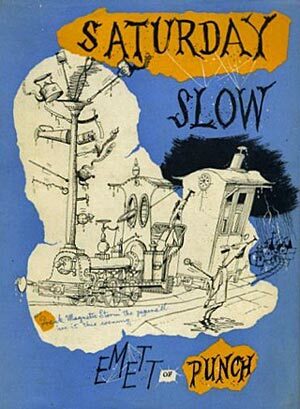 So here, to give us an excuse to tip our figurative hats to Rowland Emett, is Chipping Clinker Engine Shed. You can also check out Chris Brown’s pizza layout, based on Emett’s creations, and lots more on his wonderful pictorial web site. Rowland published a number of books of his railway cartoons (one is shown below right) that are often available at used-book sites like abebooks or alibris. For me, it’s always great fun to relive those wonderful youthful explorations into quaint byways of eccentric British rail lines! And they still live on, in many model interpretations. Aiding our search for prototype railroads for micro layouts, Herbert Fackeldey, from Aachen, Germany, has investigated “the smallest state railway in the world with just a few hundred metres of track, six points (one of which is not on the territory of the state), a station building and no rolling stock at all. It is, of course, the Vatican Railway.” An excellent track planner, Herbert has provided diagrams of both the prototype (top left) and an HO model version (lower left). 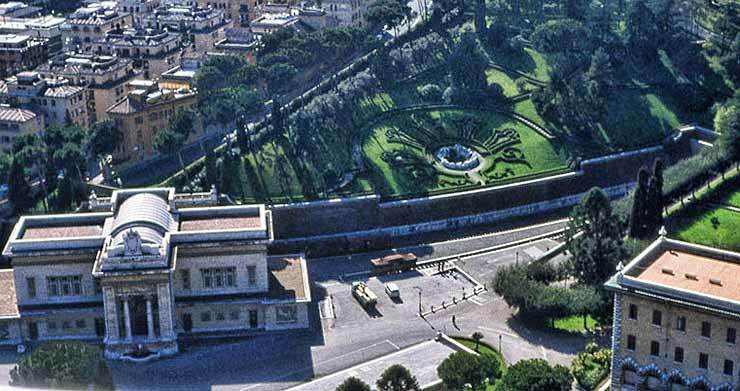 Herbert explains, “The station is very compact, closed on one end by a gate in the wall of the Vatican and ending quite conveniently in a tunnel at the other end. There is no regular passenger service, only special trains on rare occasions, but there is some goods traffic. On the photo I took from the dome of St. Peter in 1978 (below), one wagon and at least three vans may be seen (if you look closely, that is). “I have drawn what I think is the smallest practical track plan. The station building is rather large, so I think one might get away with building only half of it. A proscenium arch may be helpful to draw attention from this. At about 90 cms (three feet) the tracks should be long enough for the regular goods train of four or five vans and wagons or a special train of two or three coaches.” The plan measures 145x70cm (57×27½in) without the sector plates and is 280cm (110in) long with them. “The sector plates could be made to fold up or down, perhaps blocking the door and thus avoiding intrusions from the family or such,” Herbert points out. HERE THEY ARE… OUR READERS’ MOST FAVORITE LAYOUTS OF 2009! The results are in! Our readers have voted for their favorite 2009 layouts (up to three) from Scrapbooks #81 to #92a. Thanks to everyone who participated! The most pleasing result to me was the fact that of the 208 layouts published here in 2009, readers selected 69 of them—almost exactly one-third—as their favorites! We must be doing something right to appeal to such a broad spectrum of taste. As always happens in this kind of process, a few layouts got lots of votes, and the rest got a scattering of votes each. But in this case, the high vote-getters numbered more than a double handful… there were 11 layouts in all that received five or more mentions! That spread underscores the idea that we must be doing things that appeal to a broad range of readers. I’m going to feature those Elevated Eleven layouts and show you a previously-unpublished photo of each one… but it’s important to remember that every railroad on the list below was selected as a “favorite layout” by one or several readers. Congratulations to all the winners! It will suprise no one to learn that one layout gathered by far the greatest number of mentions. It was the HO scale Brooklyn: 3 AM, by Prof Klyzlr, from Sydney Australia (Scrapbook #87), which one reader termed “a superb example of the Art of Model Railways!” Readers heaped praise on this milestone layout, calling it “a genuinely innovative concept combined with superb modelling” and “an absolute masterpiece.” I’m happy to have this opportunity to publish yet another inspiring photo, not previously seen here, of this marvelous 2x4ft (60x120cm) layout! Next, we have the Top Ten vote getters, which are listed here in chronological order, starting with January 2009 and proceeding through the year. In each case I have unearthed a new photo, unseen before in these pages, to show off the layouts. In addition to these big winners, a number of other 2009 layouts were chosen by one or several readers as their favorites. Favorites were named from every single page of the year’s Scrapbooks. Here’s the list of winners, in chronological order. Congratulations to all! (Page 81, January 2009) Fat City Terminal RR Alexander Lösch, Elfershausen, Germany; Paunsaugunt & Red Canyon RR, Steve Jarman, St. Louis, Missouri, USA; Darjeeling Himalayan Railway, Alexander Kaczmarek, Berlin, Germany; Maldon Market Hill, Andrew Smith, Chelmsford, England; Aspendale Wharf, Henrik Laurell, Gothenburg, Sweden. (Page 81a, January 2009) Bahnhof Igelfeld, Will Vale, Wellington, New Zealand; Foxbaile, Bob Hughes, Sandbach, Cheshire, England; The Lydia Branch, Mike Allred, Norco, California, USA. (Page 82, February 2009) Cranbury Station, New Jersey, John Bruce, Los Angeles, USA. (Page 82a, February 2009) Guy’s Fizz-Bang Tram, Gerry Bullock, Essex, England; Marienbad, Sven van der Hart, Utrecht, Netherlands; The Piano Line (N), Alan Cox, Swansea, Wales; Mainlände Stadtbahnhof, Alexander Kaczmarek, Berlin, Germany; L.A. Rat Hole, MJ Idzerda, London, Ontario, Canada; Ulthwaite, Martin Hogg, Mansfield, England. (Page 83, March 2009) Ffodos, Colin French, near Ipswich in Suffolk, England. (Page 83a, March 2009) New York Harbor Belt RR, Alexander Lösch, Elfershausen, Germany. (Page 84, April 2009) Small Carriage and Wagon Workshop, Chris Bayley, Prestatyn, North Wales; 10 New Forest Way, Anonymous in Britain; St. Jude SLT, Stu Davies, Broadstairs, Kent, England; Porterhouse Sidings, Tim Halket, Suffolk, England. (Page 84a, April 2009) Tuppenny Handley, Phil Savage, Brighton, England. (Page 85, May 2009) Linkstadt-Rechtsdorf, Nigel Beeton, Bury St Edmunds, Suffolk, England. (Page 85a, May 2009) Fotherham, Graham Watling, Norwich, England; Iron Flats, Colin Oldfield, Rainhill, England. 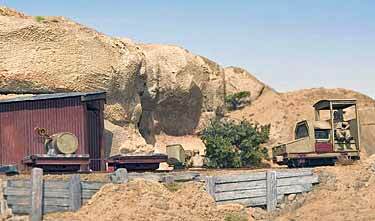 (Page 86, June 2009) Paper Scenery, Carl Arendt, Olympia, Washington, USA; Pirates Cove, Chris Walas, Santa Barbara, California USA. 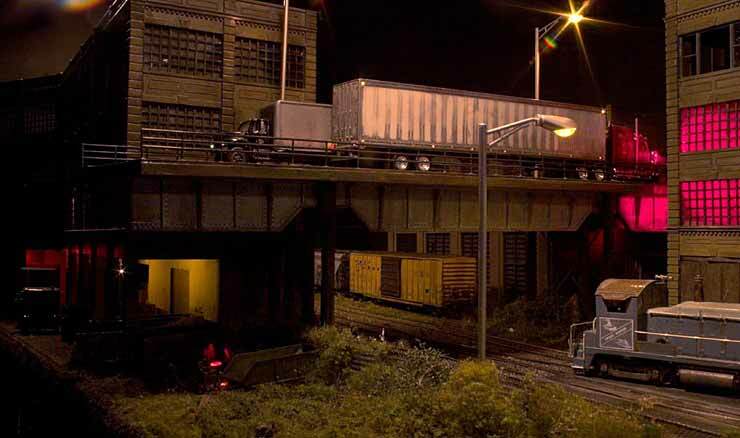 (Page 86a, June 2009) G Scale Two-Level Pizza, Victor Smith, Pasadena, California, USA; Rowand Industrial RR, Michael Sorbo, Hummelstown, Pennsylvania USA; Catcott Burtle, Chris Nevard, SW London, England; Melbridge Box Co., Phil Parker, England. (Page 88, August 2009) Point O’ Woods Railroad, Fire Island, New York, USA; Harlem Station, Will Ayerst, London, England. (Page 89, September 2009) Winona Quarry Co., Karl Schaller, Eagan, Minnesota, USA; Blindingly Obvious Car Routing (BOCR), Paul Boehlert, Atlanta, Georgia, USA; Ferrocarril Consolidado Pampa y Fernandez, Bob Hughes, Sandbach, Cheshire, England; Perko Paper Products, Geoff Perkins, Brisbane, Australia. (Page 89a, September 2009) Under Milk Wood, David Rowe, John Forman and Gareth Houghton, England; SprocketBahN, Jonathan Scott, Hamilton, New Zealand. (Page 90, October 2009) Sand Point, Richard Glover, England; Southwestern Railway Museum, Joe Hall, O’Fallon, Missouri, USA and Carl Arendt; White River and Southern, Stephan Bezier, Leipzig, Germany; Tsehum Grist Mills, Brian Wilson, Victoria, British Columbia, Canada. (Page 90a, October 2009) Double Gauge Pizza, Darren Hodges, Stratford, Victoria, Australia. (Page 91, November 2009) Idanoh City, Martin Hogg, Mansfield, England; Layout in a Suitcase, Mike Scearce, Indianapolis, Indiana, USA; Double Circle Railway, Mark Ward, U.K.; Secret Submarine Base Tram, Carl Arendt, Olympia, Washington, USA. (Page 91a, November 2009) Higgins Boats, Alain Kap, Luxembourg; Sand Works 2, Chuck Perrucci, Perkasie, Pennsylvania, USA; Feltwell Road, Stuart Reeve, Poole, England; Factory Yard, Jean-Yves Martinez, Pays de Loire, France. (Page 92, December 2009) Gato Prêto, Jacques Bratières, France; Ballard Terminal Railroad, Carsten Weye Jensen, Holstebro, Denmark. (Page 92a, December 2009) Busy, Busy, Busy, George Lermann, Germany; Nautica Sylvae Populi, Fabien Hallier, Jimmy Grondin and Benoît Evelin, France; The Wallwort Co. Supply Railway, MJ Idzerda, London, Ontario, Canada. What an impressive list of layouts you’ve selected! How about a round of applause for them? Last month I promised to share my own 2009 favorites with you. After Brooklyn: 3 AM, they were Summit, Dawson Station, and Maldon Market Hill. And thanks again to Nigel Beeton, who asked me the question that started this whole project. 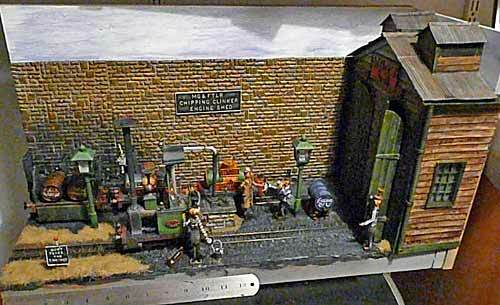 And finally, there was one vote for a very fine layout that was not featured in our Scrapbook at all; it was shown, but just as a small photo in a row of layouts reported as exhibited at the Dutch National Narrow Gauge Museum in Valkenburg, Netherlands (page 90). 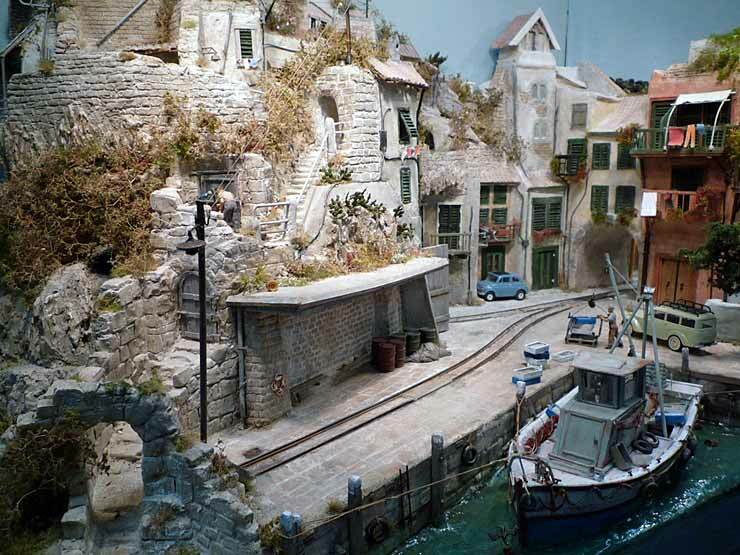 The layout is Punta Marina, by Henk Wust, from the Netherlands. 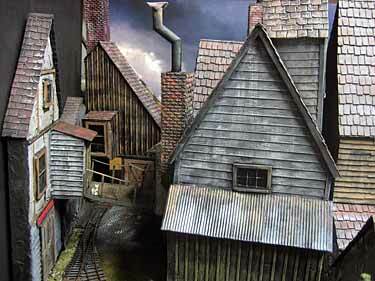 And that wayward vote gives me an opportunity to share a wonderful photo of this excellent layout, taken at the Valkenburg show by Bart Bakker, from Utrecht, Netherlands. Thanks to everyone who participated in selecting our collective favorite layouts from 2009! On the subject of wye turnouts as apposed to standard turnouts; There is a significant difference between the geometry of Peco turnouts and Atlas turnouts. This is especially true with the wye turnouts.